Is Christianity worth the cost? The Bible tells us that in order to be a Christian we must give up our own life. But is this really worth it? Christianity comes at a steep price. In 1 John 2:6 it says that “He who says he abides in Him ought himself also to walk just as He walked.” If you want to be a Christian the Bible tells you that you need to give up your own will and live the life that Jesus lived. Being a Christian means that “it is no longer I who live, but Christ lives in me.” Galatians 2:20. It’s not just a hobby. It requires your whole life. Why give up your whole life for this? So what could possibly be worth your whole life that you couldn’t get from somewhere else? What makes Christianity so special that you should give up your life for it? Is it really worth the cost to be a Christian? It’s written in Malachi 3:10, “Bring all the tithes into the storehouse,that there may be food in My house, ‘And try Me now in this,’ Says the Lord of hosts, ‘If I will not open for you the windows of heaven and pour out for you such blessing that there will not be room enough to receive it.’” Think about that for a second. You will be blessed so much that there will not be room to receive it! But you’ve got to give up your life first. It’s like you are in a car and you aren’t so very good at driving but when you let God come in and instruct you, then you find out that where He’s taking you is way better than where you were going before. And maybe you sometimes try to steer in another direction because the road bends and you don’t know what’s around the corner. It can be hard to entrust everything to Him. But until you do, God won’t be able to do a work in your life. He can’t help you if you still insist on doing it your own way. Giving everything up for God does not come automatically. The Bible tells you there’s going to be fighting ahead. But when God tells you that now you’ve got to sit down and be patient while what you really want to do is rip out your hair and scream in frustration, that’s when you can show Him that you really have given up your own will. That’s when you can say, “Lord, not my will, but Yours, be done.” And if you do that then He will help you overcome so you realize that even though “I don’t want to, I don’t feel like it, I have better ideas of what I should be doing, I can say that it is no longer I who live but Christ who lives in me.” When you do that then God gives you the victory! And you become more joyful than you ever were before. Your whole life is filled with opportunities like this. Who hasn’t sensed time and time again that their fleshSin is anything that goes against God’s will and His laws. To commit sin is to transgress or disobey these laws. The lust to sin dwells in human nature. In other words, it is contaminated and motivated by the sinful tendencies that dwell in all people as a result of the fall into sin and disobedience in the garden of Eden. This... More rises up within them? Who hasn’t sensed that anger, that impatience, that jealousy, envy, or lust that is ingrained so deeply into our nature? What’s in it for you is that God makes you happy! You don’t know how to make yourself happy. You think you do, maybe you even think you are happy now, but living according to your own will – that is the passing pleasure of sinSin is anything that goes against God’s will and His laws. To commit sin is to transgress or disobey these laws. The lust to sin dwells in human nature. In other words, it is contaminated and motivated by the sinful tendencies that dwell in all people as a result of the fall into sin and disobedience in the garden of Eden. This... More! It is a cold, empty happiness that passes quickly and leaves you worse off than where you were before. Don’t seek to save your own life. Then you will lose it; you will waste it trying to be happy in a way that is just not possible to be. Lose your life willingly, give it to God. Then you will find a life of happiness. And the handful of years that you get to spend on the earth will be filled with true joy, but there’s more to it than that. God loves you so much He wants you to be happy for eternity and after you’re done living here – after you have spent your life saying ,“Yes I want to do what God wants me to do, instead of what my lustsThe desires that we experience that go against God’s will. In other words, a desire for anything sinful. See James 1:14. Also called “sin in the flesh.” Although the expression “youthful lusts” is often thought of in connection with sinful sexual desires, lusts include anything that go against what is good and right in God’s eyes. (2 Timothy 2:22.; Galatians... More want me to do” – then you get another life even better than the last and this one won’t end in some 80-odd years. This one is eternal! So when you ask “is it really worth it?” you’ve just got to realize that it’s a trade. You are trading in your old life, full of uncertainties and empty pleasures, and in return you get a completely new life; a life that is so much better that you can’t even compare the difference! Imagine clinging to a flickering, little candle because you don’t realize you have been given the sun! Isn’t that worth it then? Isn’t it worth it to give up your old life in exchange for an eternal joy and salvation? God is waiting for you to give up your life so that He can fulfill His end of the bargain. He wants the best for you, too. You’ve just got to make your first move. 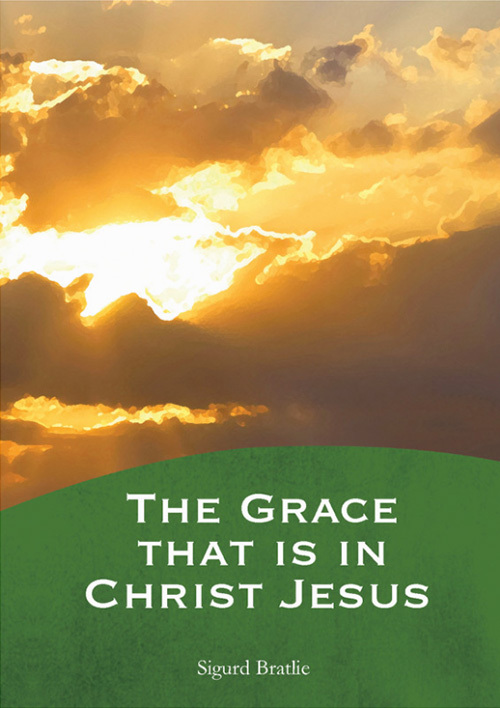 “When people think about grace, they usually think about the forgiveness of sins; and since we have all sinned, we all need grace.” Sigurd Bratlie opens this booklet about grace with these words. However, he goes on to describe in-depth that the grace that is in Christ Jesus means so much more than forgiveness. It also means truth and help. It teaches us not to sinTo commit sin is to consciously do something that you know goes against God’s will. This can be in word, deed, or even thought. (James 1:14-15)... More, so that we can be completely free to live a life of victory that leads to perfection. How can I become a true Christian? There is a huge difference between people who call themselves Christians. How many can we say are truly glorifying God with the lives they live? How can I be a successful Christian? Where is your focus in life? What does Christianity have to offer a committed and energetic young person? What opportunities exist for someone who wants to make a difference?